Recently, Construction Career Collaborative (C3) board member Tom Vaughn of Vaughn Construction emailed me a scan of an article that he cut out of the March 4/11, 2019 edition of ENR Magazine on the subject of Workforce Development entitled CURT Rolls Out Program to Grade Contractors on Training. The article tells the story of the utility Southern Company sending “its primary contractors a letter quizzing them on the level of their workforce training”. It went on to say that “the questionnaire is Southern’s first step toward prequalifying and hiring only contractors who invest in worker training”. This was done in response to a recommendation from the Construction Users Roundtable (CURT), of which Southern Company is a member, at its annual conference in Orlando in February. What makes this significant is that it may foretell a shift in how contractors are selected by those companies, like Southern, that purchase construction services. The reason that I share this occurrence is that CURT, a highly respected organization of construction users, has data that proves the value of training for the construction workforce and its impact on construction projects. The article goes on to cite the results of a case study that was profiled at the CURT conference referenced earlier, where training costs of $234,239 incurred on a project generated a labor savings of $664,364 on that same project. 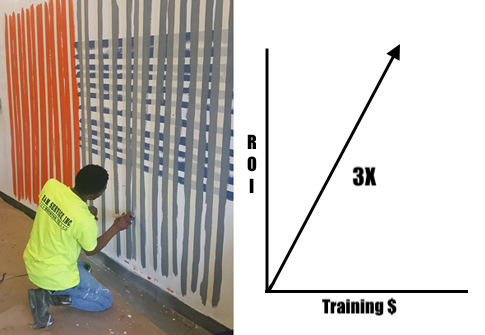 This is in addition to data gathered by the Construction Industry Institute (CII) which confirms that every dollar invested in workforce training generates a return of $3. The chart below published by CII, also referenced in the ENR article, illustrates these findings. The shift to prequalify contractors on the basis of the quality of the training of their workforce is not a surprise. It is driven by data and common sense. Trained, skilled workers are safer workers who produce high-quality work, and more of it, in less time with less rework. The employee retention rate among workers in a company with a robust culture of training is much higher than in those companies without such a culture, and absenteeism is markedly lower. The projects produced by these companies also have much lower maintenance costs over the long term. It is not a coincidence that woven into the highest performing construction companies is an evergreen culture of workforce development. This culture of training helps make these companies more profitable, which in turn enables them to continue to reinvest in training and their employees. Very importantly, it fuels their growth and makes them much more attractive to individuals considering a career in the construction craft trades or to those who are considering a change of employers. Owners are changing their process for the selection of contractors and are including training as a basis for that selection. Don’t get left behind. C3 has seasoned training professionals on staff who can help your company design and develop its craft training program, and it's free of charge for C3 Accredited Employers. For more information, please contact C3 Associate Director, Angela Robbins, either by phone at 713.999.1032 or via email at angela@constructioncareercollaborative.org.